With back-to-school in the air and football season around the corner, yogurt manufacturers are getting creative with new ways to enjoy yogurt. Just this week I learned of three new formats. Congrats to these companies for their innovation efforts. Sources tell me there are more to follow. Canadian dairy cooperative Agropur has created what it claims is the world’s first crunchy yogurt bites snack. Sold under the iögo brand, the high-protein snacks are made using vacuum microwave dehydration. “Agropur is the first company to use this process to dehydrate yogurt while preserving its benefits. There are no similar products on the market, here or anywhere else,” says Martin Parent, general manager-yogurt. Dehydrated, dried and baked cheese snacks have become quite common. This format presents an opportunity to take yogurt out of the refrigerator and into the snack aisle. The snacks come in four flavors—Applewood Smoked BBQ, Cheddar, Salted Caramel, and Sour Cream and Green Onion—in 35 grams single-serve packs. The iögo crunchy bites contain 10 grams of protein per portion. They are designed to be eaten on the go, much like chips. Another snacking innovation comes from Stonyfield. 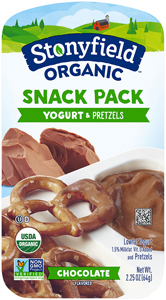 New Stonyfield Organic Snack Pack is a refrigerated dual-compartment container with flavored yogurt in one part and a dipper in the other, making this a no spoon needed treat. Designed for kids, the three combinations are: Chocolate Yogurt with Pretzels, Chocolate Yogurt with Graham Crackers and Strawberry Yogurt with Graham Crackers. A single-serve 2.4-ounce pack contains 110 to 130 calories, 1 to 2.5 grams of fat, 6 to 10 grams of sugar and 3 to 4 grams of protein. 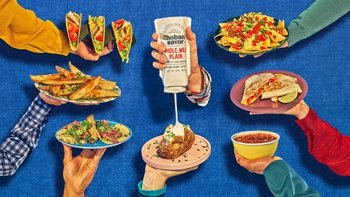 Chobani is launching a convenient condiment that may be an alternative to sour cream called Chobani Savor. This Greek yogurt ingredient is available in a squeezable, easy-to-use 14-ounce resealable pouch. It’s perfect for use as a topping on baked potatoes, tacos and soups. It can also be added to sauces, dressings and marinades for a creamy texture and satisfying taste. 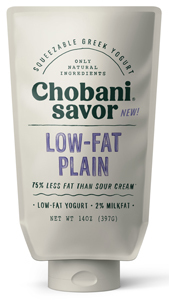 Chobani Savor has 50% fewer calories, 75% less fat and twice the protein than the equivalent amount of sour cream. Made with only natural, non-GMO ingredients and fresh milk from cows not treated with artificial growth hormones, Chobani Savor contains no artificial flavors, sweeteners or preservatives, and is gluten free. Chobani Savor comes in Low-Fat Plain and Whole Milk Plain, with a 2-tablespoon serving containing 20 to 30 calories, 0.5 to 1.5 grams of fat and 3 grams of protein. Hope this provides you inspiration to get creative with yogurt and expand its usage occasions.